Solid Surface worktops give a contemporary sleek look to your kitchen with fresh clean lines. They are manufactured using state-of-the-art technology to create a strong, durable and non-porous surface. Available in a wide range of styles and colours, solid surface worktops add a splash of sophistication to your kitchen that laminates just can’t muster. fit all types of solid surface products. 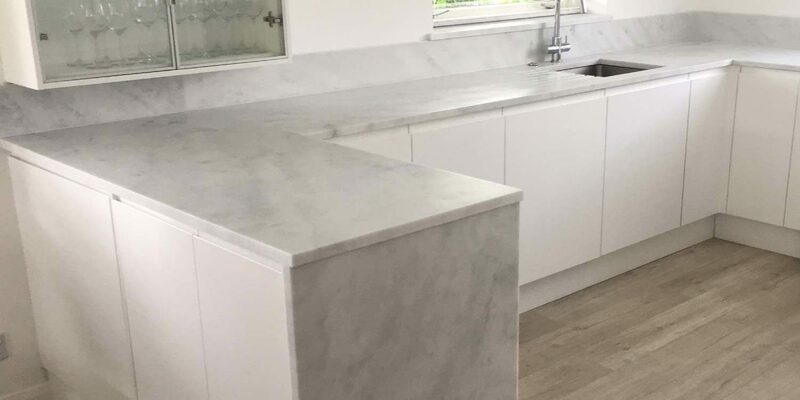 There are two types of solid surface worktops on the market: solid acrylic all the way through, such as Minerva and Apollo Slabtech, and Acrylic surface with a chipboard core (6mm solid surface top). Also available is 6mm acrylic top with a chipboard core from brands such as Maia, Wilsonart Earthstone, Bushboard Encore and Apollo Magna. In the fabrication process, joints can be made invisible by joining the relevant pieces with the manufacturers own colour-matched two-part acrylic epoxy. The pieces are clamped tightly together in order to express any excess adhesive. After the adhesive dries, the area is sanded and polished to create a seamless joint. This seamless appearance is a signature characteristic of the material. Midland Worktops Fitters can install your under mounted sink using the appropriate jig template and router and drainage grooves can also be added as required. Cuts and scratches can be buffed out with a Scotch-Brite pad or orbital sander. If you have built your own kitchen units or had them professionally installed for you Midland Worktop Fitters will fit your worktops to the very highest standards ensuring they fit perfectly, look great and provide many years of service for you and your family.